This is a developing story, please check back often for the latest updates. The latest update from the National Hurricane Center is not a good one for Florida as there is now a projected landfall for Hurricane Matthew early Friday morning near the Kennedy Space Center as a Category 4 hurricane. The projected track also indicates Hurricane Matthew will hug the Florida coast starting Thursday evening and through Friday night. You can view the current forecast, including position and winds of Hurricane Matthew in the featured image above. Current Watches and Warning in Florida. A Hurricane Warning is an effect for inland counties including Seminole, Orange, Osceola, and Okeechobee. A Hurrican Watch is an effect from the Flagler/Volusia County line to the Savannah River in Georgia. A Tropical Storm Warning is an effect from Chokoloskee in Collier County to Golden Beach as well as the Florida Keys from Seven Mile Bridge eastward. Florida Bay is also included in the warning. A Tropical Storm Warning is an effect for inland counties including Lake, Sumter, Polk, Highlands, Glades, Hendry as well as most of Collier County. A Tropical Storm Watch is an effect from north of Chokoloskee in Collier County to the Suwannee River on the Levy/Dixie County line. As for game cancellations and reschedules, please check the “Game Reschedules/Cancellations” tab above. That section will be updated as often as possible with updates. Right now the center of Hurrican Matthew is projected to stay off the coast. The latest forecast track from the National Hurrican Center including Watches and Warnings can be seen in the featured image above. Also, we have posted a big update in the Game Reschedules/Cancellations section. There will be more updates to come as verify games that have been rescheduled, pending rescheduling or have been canceled. Please follow your local media outlets for updates on evacuations and other things to prepare for Hurrican Matthew at this time, but please check back here for the latest updates on high school football games being canceled or rescheduled. Due to the recent changes in the forecast, Port Canaveral in Brevard County has been ordered to evacuate, according to News 13 in Orlando. As of 5:00 p.m. ET, Hurricane Matthew still has winds of 140 m.p.h. and is moving to the north at 9 m.p.h. according to the National Hurricane Center. However, there has been some changes to the forecasted track as the National Hurricane Center believes that the eye of Hurricane Matthew will hug the Florida coast Thursday afternoon and all day Friday, however, a more definite forecast will not come until tomorrow. With that the Hurricane Watch has now been extended south to Golden Beach and continues up the coast to the Volusia/Brevard county line, while a Tropical Storm Watch is in effect from Seven Mile Bridge in the Florida Keys to Golden Beach as well as Lake Okeechobee. As for football games being canceled or rescheduled, we are working feverishly on the list to update which you can find on the tap Game Reschedules/Cancellations. Please check back often for updates on this. Palm Beach first school district in Florida to announce they will close school on Thursday and Friday due to Hurricane Matthew. As such, all district-related athletic events have been canceled, Jodie Wagner of the Palm Beach Post is reporting. The School District of Palm Beach County will close Thurs. and Fri., meaning all district-related athletic events are canceled. The next complete advisory on Hurricane Matthew is due around 5:00 p.m. ET from the National Hurricane Center. We will bring a full and complete update then as we expect more games to either get rescheduled or be canceled in the process. The center of Hurricane Matthew was located 90 miles South of the tip of Cuba, according to the advisory. The good news is some parts of Florida have been removed from the cone of concern for the projected path of Hurricane Matthew, but weather conditions are still expected to deteriorate later this week for most of the peninsula. 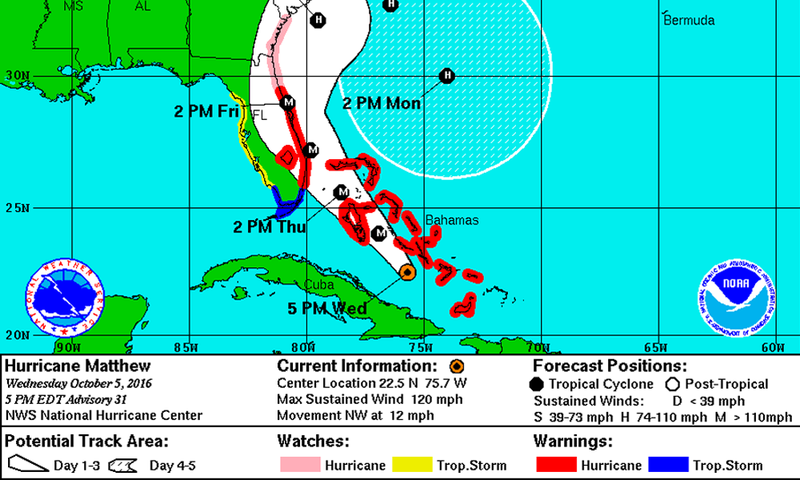 A direct landfall in Florida, however, is not anticipated at this time, according to the forecasted track. However, with all of this, parts of the state now have been placed under watches. A Hurricane Watch is in effect from Deerfield Beach, Florida to the Volusia/Brevard county line. A Tropical Storm Watch is in effect from the Seven Mile Bridge in the Florida Keys northward to south of Deerfield Beach, including Lake Okeechobee. Also with that comes our first game reschedules of the day. First, Florida Today is reporting that this week’s game between Holy Trinity and Eau Gallie has been rescheduled for Wednesday evening with a kickoff at 6:00 p.m. ET. Also, Chris Boyle at the Daytona Beach News-Journal is reporting that Friday’s game between Pine Ridge and DeLand has been rescheduled for Monday. As of the 8:00 AM ET intermediate advisory from the National Hurricane Center, the forecasted track has the eye of Hurricane Matthew less than 50 miles from the east coast of Florida by Thursday night. The National Hurricane Center is preparing to issue Tropical Storm and/or Hurricane Watches for part of the Florida peninsula and the Florida Keys later morning, likely with the next complete advisory at 11:00 AM ET. Right now no games have been canceled at this time, however, some coaches in a few areas are likely to make calls about canceling games sometime today as it appears the track could shift further west with some computer models suggesting a possible landfall in Florida. GAINESVILLE, Fla. — Last month Hurricane Hermine, broke the 11-year old record of a hurricane not hitting Florida. Now the Sunshine State might be in for its second hurricane of the season and it could literally impact the majority of games for Week 7 with the latest forecast track. As of 11:00 p.m. ET on Monday night, things were not looking good for the state as the cone of concern or error has now included the majority of the Florida peninsula in the advisory issued by the National Hurricane Center in Miami. This comes on the heels of the 5:00 p.m. ET advisory Monday afternoon that shifted the forecast track to the west. The advisory indicated that hurricane force winds extend 40-miles out from the center and tropical storm force winds extend 185-miles out from the center. Matthew was packing winds of 145 m.p.h. according to the advisory. With all of the changes to the forecast, Florida Governor Rick Scott declared a state of emergency for the entire state. We are working with the EOC and monitoring Hurricane Matthew. Let's hope it stays far away from Pasco County.
.@browardschools is monitoring #HurricaneMatthew and will provide regular updates to our community regarding any impact to our schools. Also due to the recent changes in the forecast, FloridaHSFootball.com will not be publishing its normal Top 10 Games of the Week feature due to the anticipation of game cancellations. If you see a game that is not on this list that has been canceled or rescheduled or see a game on here that needs to have any changes made to it, please email it to football@floridahsfootball.com or leave a comment in the comments section at the bottom of this page (click on the button that says comments). Cedar Creek Christian vs. Deltona Trinity Christian at Central Florida Christian Academy, Orlando, 2 p.m.
Hilliard at Fort White, 7 p.m.
South Lake at Lake Highland Prep, 7 p.m.
Buchholz vs. Gainesville at Citizens, 7:00 p.m.
Chiefland at Dixie County, 7:30 p.m.
Suwannee at Santa Fe, 7:30 p.m. Triumph Christian at Berkeley Prep, 7 p.m.
Union County at Hawthorne, 7:30 p.m.
Williston at Branford, 6 p.m.
Colonial at Kissimmee Gateway, 12 p.m.
Foundation Academy at Jordan Christian Prep, 7:30 p.m.
Keys Gate Charter at Belen Jesuit, 10 a.m.
Kissimmee Osceola vs. St. Cloud, 4 p.m.
Lake Weir at Eastside (at Eastside HS), 5 p.m.
Legacy Charter at Central Florida Christian, 11 a.m.
Manatee at Palm Harbor University, 11 a.m.
Miami Booker T. Washington vs. Northwestern at Traz Powell, 5 p.m.
Miami Central vs. Miami Jackson at Traz Powell, 12 p.m.
Miami Sunset at Miami Springs, 10 a.m.
North Broward Prep at Westminster Academy, 6 p.m. Port Charlotte at Sebring, 12 p.m.
Reagan vs. South Miami at Tropical, 7 p.m. Seven Rivers Christian at Santa Fe Catholic, 12 p.m.
Southeast at Cardinal Mooney, 1 p.m.
Westminster Christian at Chaminade-Madonna, 12 p.m.
Bishop Moore at South Sumter, 7 p.m.
Bishop Snyder at Christ’s Church, 7 p.m.
Bronson at Wildwood, 6 p.m.
Centennial at South Fork, 6 p.m. Faith Christian at The Master’s Academy, 7 p.m.
Flanagan at Plantation at PAL, 5 p.m.
Fort Myers Canterbury at All Saints, 4 p.m.
Fort Pierce Westwood at Okeechobee, 6 p.m.
Eagle’s View at University Christian, 7 p.m.
Hagerty at East Ridge, 7 p.m.
Holy Trinity at Eau Gallie, 6 p.m.
Jupiter at Forest Hill, 7 p.m.
LaBelle at Tenoroc, 5 p.m.
Lake Howell at Edgewater, 7 p.m.
Lake Mary at Winter Springs, 6 p.m.
Lake Mary Prep at Orangewood Christian, 6 p.m.
Lake Minneola at Mount Dora, 6 p.m.
Lake Placid at Mulberry, 7:30 p.m.
Mater Academy at Goleman, 4 p.m.
Miami Southridge vs. Miami Killian at Tropical, 7 p.m.
Nease at West Nassau, 7 p.m.
Ocoee at West Port, 7 p.m.
Orange City University at Oviedo, 6 p.m.
Pierson Taylor at Bell, 6 p.m.
Pine Ridge at DeLand, 7 p.m.
Pinecrest Prep at Highlands Christian, 7 p.m. Port Orange Atlantic vs. Seabreeze at Spruce Creek, 7 p.m.
Raines at First Coast, 6 p.m.
Rockledge at Astronaut, 7 p.m.
St. Joseph at St. Johns Country Day, 7 p.m.
Sanford Seminole at Lyman, 6 p.m.
Santaluces at Delray Beach Atlantic, 6:30 p.m.
Tavares at The Villages, 6 p.m.
Terry Parker at Paxon, 5 p.m.
Wolfson at Mandarin, 6 p.m.
Wellington at Dwyer, 7 p.m.
George Jenkins at Lakeland (tentative), 7 p.m.
Bayside at Sebastian River, 7 p.m.
Ponte Vedra at Bartram Trail, 7 p.m.
Providence at Atlantic Coast, 7 p.m.
Miami Norland at Delray American Heritage, 7:00 p.m..
Baldwin at Stanton, 4 p.m.